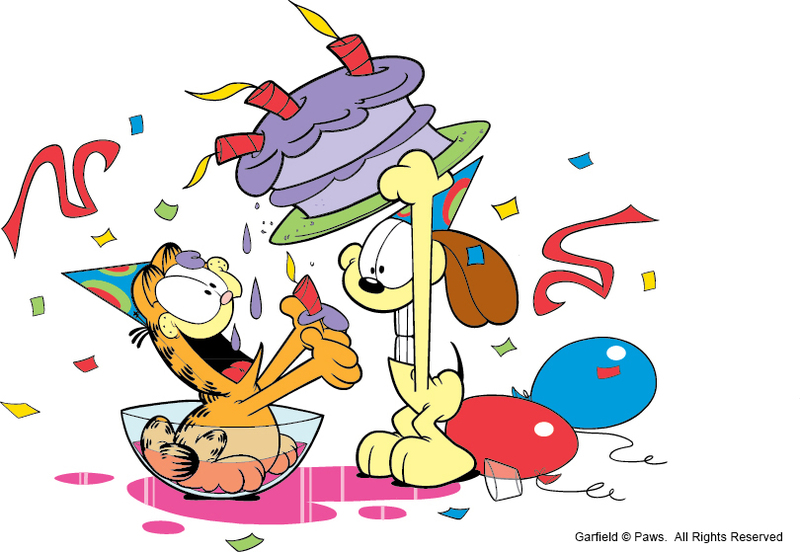 June 18, 2012 – Attention Garfield fans: for the next two weeks, the famous feisty fat cat will celebrate his birthday (June 19, 1978) by offering special giveaways on two official Garfield apps for Google Android devices and iPhone/iPad! From June 19th to July 4th (inclusive), simply download and play the free apps Garfield’s Defense and Garfield’s Diner from Google Play or Apple iTunes to receive special birthday goodies and free in-game currency! 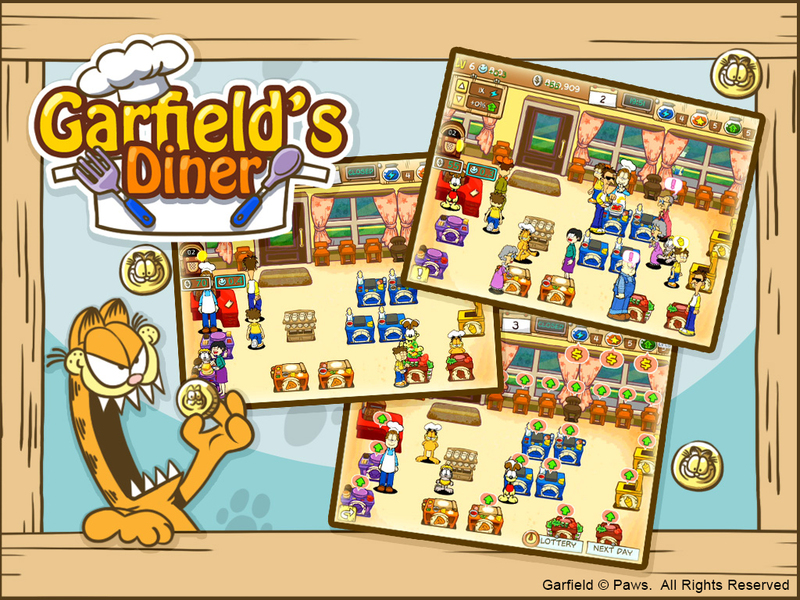 Garfield’s Defense and Garfield’s Diner are official Garfield products for Android and iOS produced in collaboration with and authorized by Garfield creator Jim Davis and Garfield licensor Paws, Inc. Download the apps free of charge from Google Play and Apple’s iTunes between June 19th and July 4th to enjoy birthday specials and free in-game currency! 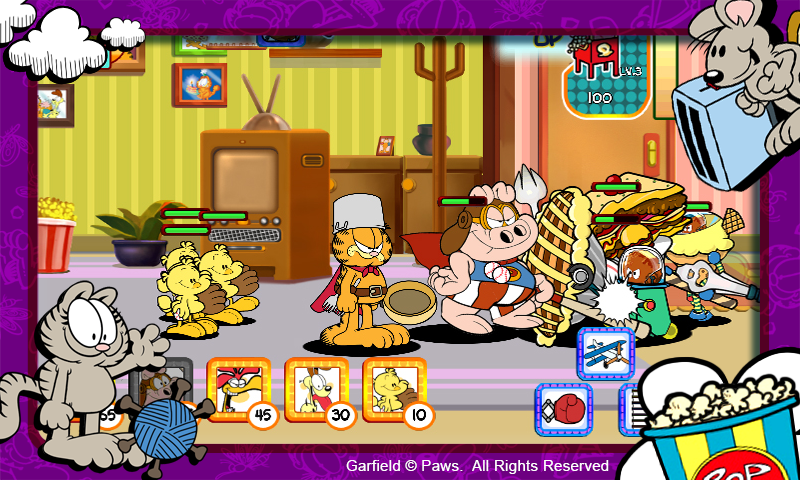 Garfield’s Defense combines tower and siege defense as well as combat game styles into an epic action-strategy title boasting gorgeous cartoon graphics. Extraterrestrials have invaded Garfield and Jon’s home to steal all food, but they neglected to take into account the feline defender of all lasagna! See Garfield unsheathe his claws! 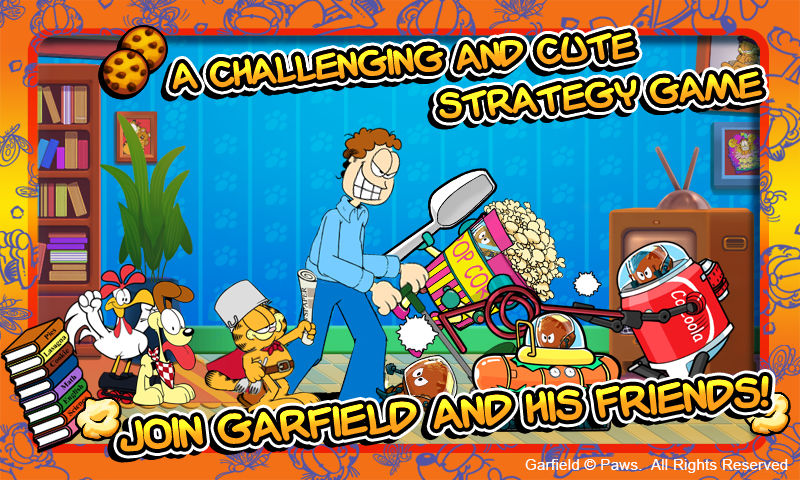 Garfield’s Defense is available on Google Play (link). Download it between June 19th and July 4th to receive free birthday goodies including a Super Pie, Special Friend Pizza, Popcorn Box, Garfield’s Suit-up Box, and 500 free cookies (in-app currency). Please note that Garfield’s Defense is not yet available on iTunes (coming soon). Garfield’s Diner features Garfield and Jon, who – in one of history’s potentially greatest miscalculations – have been left in charge of Irma’s Diner while the proprietor enjoys a much-deserved vacation. Help Garfield and Jon operate Irma’s Diner while she’s away; you will need your best reflexes and time-management skills to overcome the challenges faced by these two inept restaurateurs! 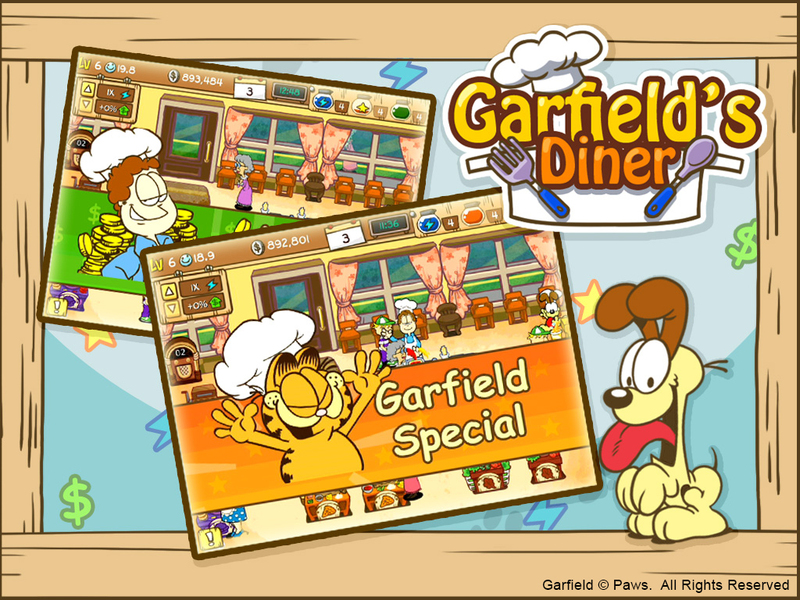 Garfield’s Diner is available on Google Play (link), and on Apple iTunes (link). Download it between June 19th and July 4th to receive new birthday themes and 30 Garfield Points (in-game currency) completely free of charge! GARFIELD was born on the comics pages on June 19, 1978. The mastermind of cartoonist Jim Davis, GARFIELD is a humorous strip centered on the lives of a quick-witted orange cat who loves lasagna, coffee, and his remote control; Jon Arbuckle, his owner; and Odie, a sweet but dumb dog. GARFIELD was introduced to the world in just 41 newspapers and is now the most widely syndicated comic strip ever, appearing in 2400 newspapers. The success of the comic strip spawned a popular animated TV show, Garfield and Friends, which appeared on CBS-TV from 1988 to 1995, and is currently in worldwide syndication. 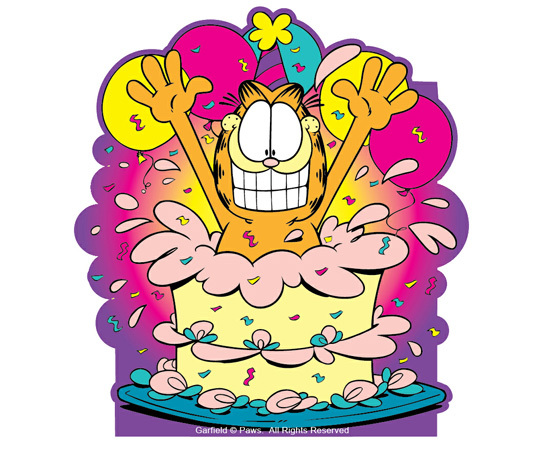 In 2009, The Garfield Show debuted on Cartoon Network USA and now airs in 135 countries. PEOPLE magazine called the show, “One of the Year’s Best New Kids’ Shows” in 2009. In 2004, Twentieth Century Fox invited Garfield to star in his first-ever full-length feature film, Garfield: The Movie. A sequel, Garfield: A Tail of Two Kitties was released in June 2006. The movies earned over $340 million at the box office. Garfield has also starred in three CGI animated movies, all penned by Jim Davis. Fox released Garfield Gets Real (2007), Garfield’s Fun Fest (2008), and Garfield’s Pet Force (2009) on DVD and in limited theatrical release. Garfield also entertains his fans on a popular web site, garfield.com, and engages kids in interesting and pedagogically sound activities to promote literacy at professorgarfield.org. English, Science and Life Skills are among the topics Garfield and his pals address at learninglab.org, a public service of the Virginia Department of Education. Garfield has long been considered a “classic” or “evergreen” property because he has not only endured, but continues to be fresh and funny after nearly 35 years in the limelight. Follow Garfield, along with 3.5 million other fans, on Facebook (facebook.com/Garfield) and Twitter (twitter.com/Garfield).